Within a journal article or presentation, it may be necessary to include a figure that shows the ‘bigger picture’ of the area of interest, before focussing in on a particular element. Therefore, in addition to having a range of basic images that can be edited and adapted, as outlined in a previous blog post, it would also be desirable to have a set of images that illustrate one element with increasing levels of detail. These images would be consistent with each other, in terms of their visual style, and, ideally, could each be edited or adapted in their turn. For example, in a discussion of the hypothalamus and pituitary gland, an initial figure could show their location in the context of a human head or brain. A second figure could then zoom in to show more detail of the elements themselves. Using the line drawing of a human head (produced in the previous blog post) as a starting point, Gill edited that image specifically to highlight the hypothalamus and pituitary (see top left image below). 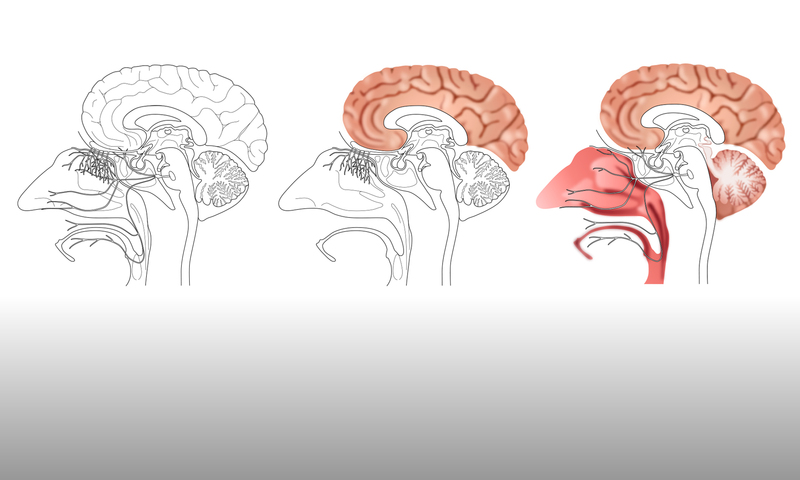 This image was then further edited and adapted to show the hypothalamus, pituitary and the surrounding area in more detail, with elements of the brain and skull retained to give context (top right image below). Using a variety of existing figures as reference, Gill then drew a more detailed image of the anatomy of the hypothalamus and pituitary (bottom right image above). This image was then adapted to include a representation of the blood supply network and the hypothalamic nuclei (bottom left image above). All of the images were drawn to maintain a consistent visual style, so that each image can be easily related to the others in the sequence. However, it definitely requires input from the members of the neuroscience department to ensure that these images are fit for purpose, as Gill is relying on the reference figures to be reasonably anatomically correct. The amount of variation in these figures can be considerable, as the re-drawn examples posted on the neurographical instagram feed demonstrate. This variation becomes more extreme when smaller elements such as the hypothalamic nuclei are included. Representations of nuclei vary from approximately anatomical, e.g., shown as a bundle of neurons, to completely diagrammatic, e.g., shown as simple geometric shapes. The neuroimaging department members would have to determine which representations they would need for their figures, to ensure that each image produced is consistent and can then be easily adapted by their colleagues.